I was in a baking mood yesterday so I made some more Pumpkin and Peanut Butter Dog Cookies. I got 46 out of this batch. Since my boyfriend is allergic to peanuts I never bake with peanut butter or peanuts. But Jack knows that when he smells peanut butter, it's cookies for him! 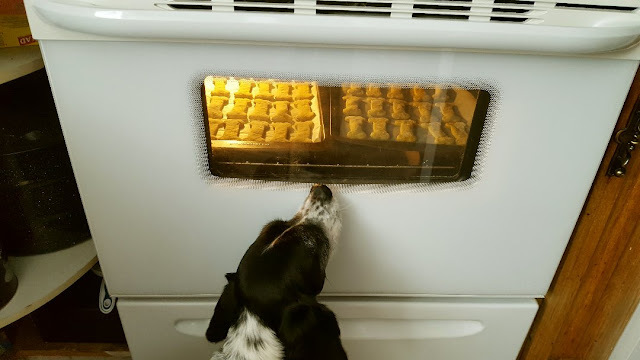 He waited very patiently by the oven until they were done! Someone asked me why I bother to cut them with the bone-shaped cookie cutter. Why? I don't know, because it's FUN! I know the dogs don't care one way or the other, but I do! Since we ate our last freezer-pizza on Saturday, I decided to make two more with the leftover ham in the freezer. 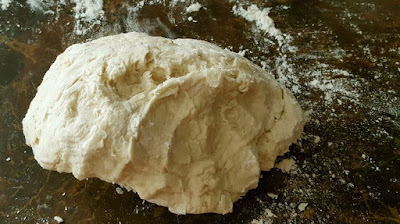 Everyone has their own favourite dough. 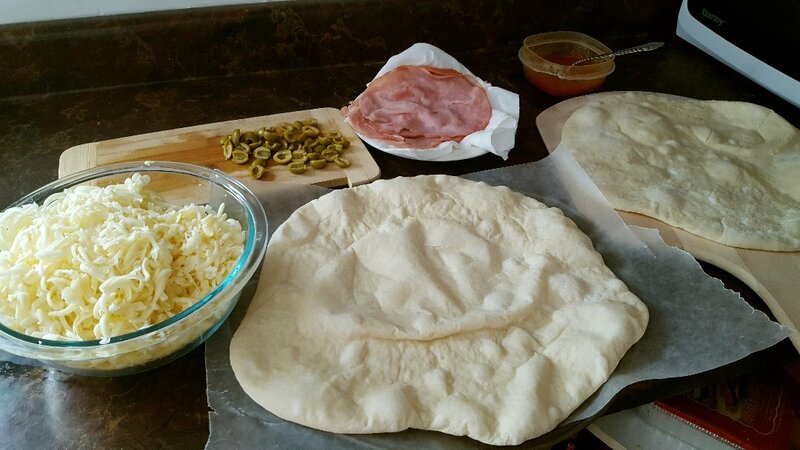 I got mine from a cookbook called 500 Pizzas and Flatbreads. 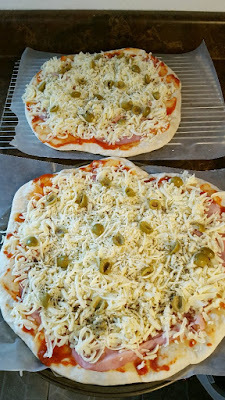 It's Basic Pan Pizza Dough - but I roll it out quite thin to make 2 large pizza crusts. 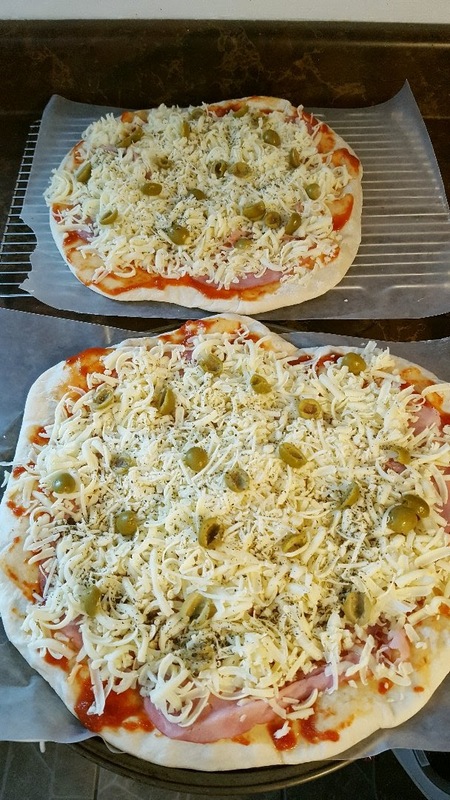 It's SO HARD not to want to eat the pizza as I'm preparing it, but I had to keep reminding myself it's for a quick lunch or dinner when I'm too tired to cook!! And a baking disappointment :((( I'm a huge fan of Williams Sonoma and I have 22 of their cookbooks. Once in a while I come across a disappointing recipe. This was one of them! From the Breakfast book, I made a Cranberry Coffee Cake with Streusal Topping. I've included the recipe for anyone who wants it, but I really didn't have a good result. I switched the cranberries for cherries and mine is dark because we use brown sugar. It wasn't sweet at all and the topping....all you could taste was the flour, sigh. I re-checked the recipe to make sure I didn't flub up, but no, I followed it to a T. I was so bothered by this...I really don't take it well when a recipe doesn't work, I guess because I put so much time and love into it! My boyfriend Alex said to me "In our 4 years together, you've made me over a thousand dinners. One disappointing recipe out of thousands is still very good darling." He ate it anyway...he's so nice, he knows how sensitive I am! But I think this will be fed to the garbage bin today while I think of something else to bake! How many meals have you made for your significant other/family/self/fur-kids? I'm sure you can all out-do my 1400 or so! (I just did 365 x 4 years for an estimate - not to mention breakfasts, lunches, sweets and snacks...) When you come up with your number, you should feel pretty proud of yourself :) I'm going to remind myself of that the next time I have a failed recipe! Alex made dinner. We had what we call European Hot Dogs, though I'm not quite sure how European they are! 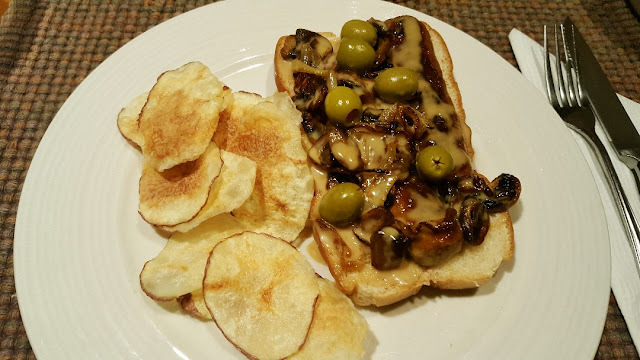 We use Italian sausages and Alex makes a honey mustard sauce, which I don't have any recipe for since he's the master of "winging it" - which I cannot do. 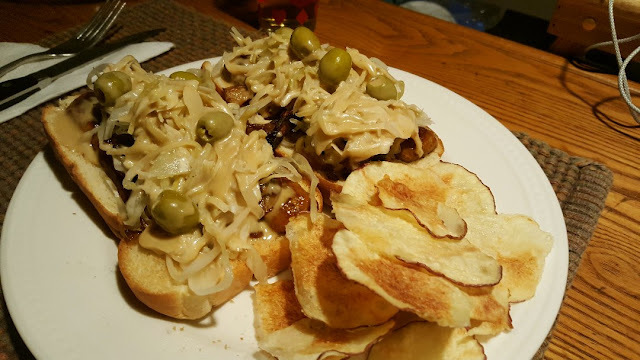 He loads his hot dog up with sauerkraut. Mine has no sauerkraut - I'm not a fan of it. We caramelize mushrooms and onions too, it's SO GOOD...and so filling too. I made the homemade potato chips to go with it. These are tricky to make because we don't deep fry. I started them in the microwave but then had to finish them in the oven. 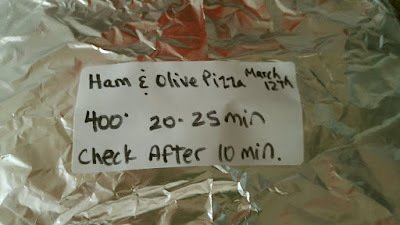 We found out that our microwave can't handle the workload very well, it got SO HOT to the touch after about 12 minutes of cooking off and on plus not all of the chips cooked well, half were soggy. I won't include a recipe this time. I need to find a better one. The chips that did turn out were crisp and yummy though! 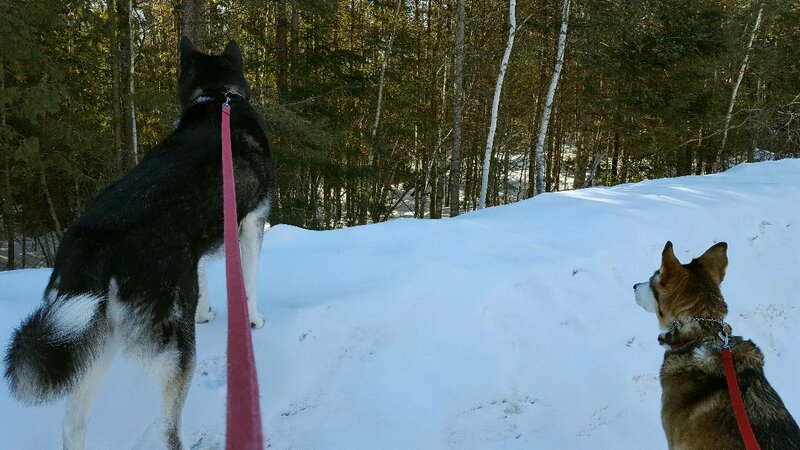 Despite the hair-freezing weather again today, the huskies got their 45 minute walk! Charlie walks on the snow banks while Marlene and me are on the side of the road...Charlie always thinks she sees something in the woods! 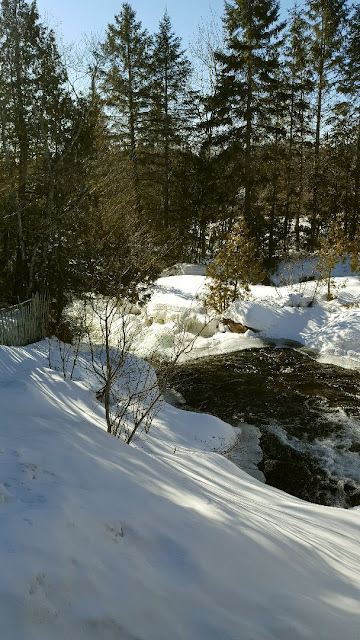 Despite the deep freeze, the river flows on. How poetic lol...that water must be frrrrreeezing. That's where the huskies swim in the nicer weather every day after their long walk, they get so hot in the summertime. We bought a kiddie pool for them last summer, but they only use it as a big water dish, I think they prefer to smell like the river! Not only am I going to move in with you, but I'm bringing the dogs! Your cooking is amazing, as always. I hate it, too, when something that I've spent time and money on turns out disappointing. We are bracing for the next "explosive" weather. I really can't wait for spring. HI Susan :)) Come on down! :) Oh yes, bring all the pets, I'll bake for them too!!! :) I was trying my best not to think of the cup of unsalted butter that went into that recipe...butter is so darn expensive, but it is money wasted, I hate that. I can't really give this to the pets or the birds, or even the composter. I feel it's such an overall waste, but what can you do? Try again I guess! Every year we get a huge snowstorm around St-Patty's so I'm bracing for it myself! Hmmm...a european hot dog...lol hot dogs are not a big thing in Europe in general. Although there are all jinds of different saussages on the bun. We have a very famous version of it ... the curry wurst. It is a cut up big weiner with a curry sauce. It's not on abun tho. You usually eat it with fries ketchup and majo. Then there is the bratwurst on the bun wich has to come from the bbq. There is different sizes flavours etc etc. On a bun and some people load them with sauerkraut. Sauerkraut is however not typically eaten with saussage. Its more a dish eaten with potatoes and ham. Do u cook your pizza before u freeze it ? I like how thin the crust looks. That's gow i like my pizza. With a super thin crust. Thanks Nancy :) Jack didn't move until I pulled them out, then he parked himself under the counter until they cooled. Hey Nik :) Yeah, I figured we mis-labeled our hot dogs lol...we just wanted to differentiate from the North American ones that you have to eat 10 of to get full!! :) Actually reading your description reminded me that I had Weisswurst during some Oktoberfest when I worked in bars back in my younger years...I remember how delicious that was served with potatoes and sauerkraut...I'll have to look for those again. Yes, I cook the dough for about 3 minutes at 500 and let it all cool before I put the toppings on for freezing. It puffs up like a pita actually so I push it down with the pizza peel. Otherwise, it gets too soggy. The Moon was so beautiful last night but we went to bed really early, we were both pooped from the time change trickery! ;) I think I'll call it the Full Sap Moon from now on because there are NO WORMS around here yet! So much great food! 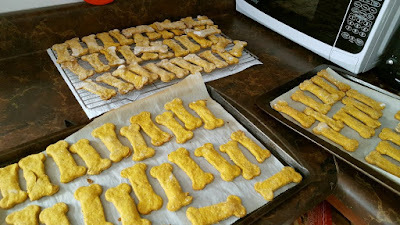 I love that you cut the pup's treats into bones, it's such a sweet touch! The picture of him waiting at the oven is adorable. I'm still learning to enjoy cooking, but I've gotten a little better every year. You're certainly an inspiration to try out new recipes! 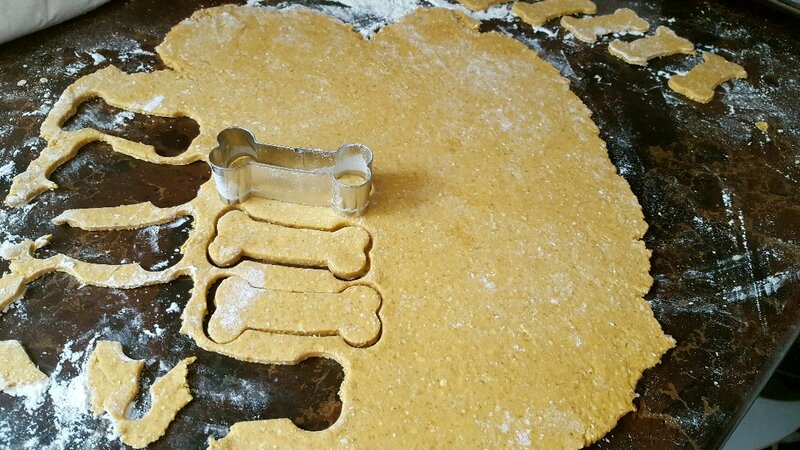 i love your pup watching the treats bake..too funny! i hate it when something doesn't work. i do not want to know how many meals i have ever made. if i had to guess....about a gazillion! 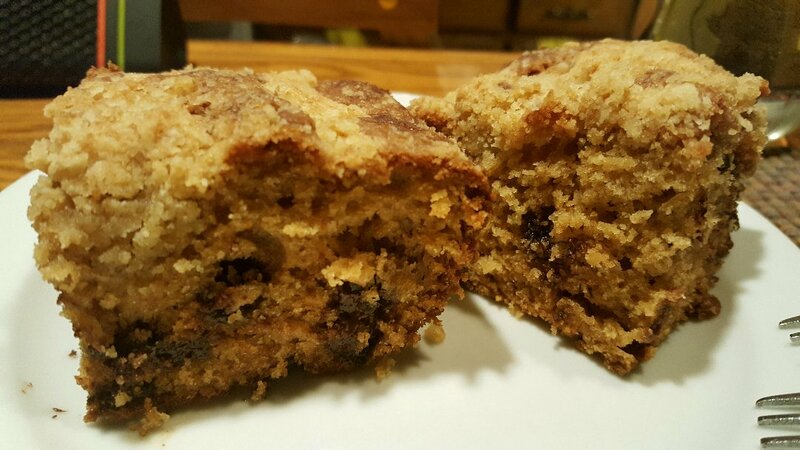 Hi Rachel :)) Thank you :) Cooking and baking is so much fun for me, but I'm an avid recipe-follower, it's the only way I feel confident enough to do it! I try to challenge myself. For Christmas I made a Yule log cake, a first, with meringue mushrooms as a decoration, and I had to look up a You Tube video to help me! It's so rewarding though, well, until you get a bad recipe!!! Your posts continue to be simply wonderful. That picture of Jack waiting for his treats to finish baking is priceless. I feel the same way you do when I make something that doesn't turn out. As you say, all that time and energy and expense for . . . nothing. Matter of fact, if it's a new baked goodies that calls for a cup of butter I usually pass it up for fear I will be wasting a whole cup of butter! Just love all the photos. Especially the expectant Jack on what I am sure he is thinking is the wrong side of the oven door. Let me think about my meal record. I get it a bit easier than Mama Pea as all the time we have been together we tend to graze on our own for all but dinner. So I guess I am at the 16,190 meals in 46 years. However when children came along I guess technically we could double that as I made breakfast ever day for them . So that puts me in the 32, 390 range. We have rarely eaten out and haven't been together as long as Mama and Pa Pea have so I bow to Mama Pea. The upside of that is either I am younger than Mama Pea or she was a child bride. Here is to more meals and homemade chips. You go girl! Hi Mama Pea :) Thank you :) I know, a whole cup of butter into the trash basically, it kills me...Ha ha ha...I'm making the potato chips because I am convinced those Ruffles I ate the night before my birthday gave me the food poisoning. It's likely a mental thing, but I never want to eat another processed chip again!!! The homemade ones taste exactly like Pringles. Oh MY...54,750 meals!!! That is amazing Mama Pea!!! I love making pizza dough and will try out your shared recipe, thank you! :) I am always on the hunt for a different recipe. I have come across the William Sonoma recipes online, but have never made. Yet! I get discouraged when recipes don't turn out, my husband is a champ and eats is anyway. I usually wind up throwing it out regardless. Hi Yarrow :)) Thanks for the compliment! LOL...I CANNOT handle being a mad scientist in the kitchen....I just don't have it in me but I admire those who do.